DOWNEY – To begin this article, let’s step back first to the Downey Symphony’s Red Violin concert last February when the orchestra and violinist Elizabeth Pitcairn presented Vivaldi’s “The Four Seasons,” as in spring, summer, autumn, winter. The plan for the performance included two narrators in period costume to recite poetry associated with each season, verses that inspired Vivaldi to compose his wonderful music in 1725. Elizabeth Pitcairn enlisted her friend, the actress Sela Ward, to read the verses in English. Music Director Sharon Lavery’s task then was simply to find a visually striking male counterpart with great stage presence who could speak the Italian poetry convincingly and look comfortable in an elaborate scarlet satin coat with fancy cuffs appropriate to the year 1725 before a packed house in Downey’s Civic Center Theatre. Sharon appealed to USC’s opera department and brought us a student named Anthony Moreno. He fit like a fine glove. The concert was a triumph, a delighted audience on its feet, bows, curtain calls, flowers, cheers, and from somewhere a special request to hear a few words from the two narrators. Sela Ward stepped forward graciously, smiled, and brushed modestly over her considerable accomplishments in film and television. Anthony Moreno told us he loved his studies in opera at SC. And then, on impulse, Sela invited him to sing something from a favorite aria. Though he was caught completely off guard, out poured this glorious baritone voice in a segment of the Love Duet from “Pagliacci.” It didn’t take long for Sharon Lavery to engage a rising talent, Anthony Mroeno, as our soloist for the first concert of the orchestra’s new season. And that will be Saturday evening, Oct. 11, friends. “One of my earliest memories,” Anthony recalls, “was listening to music and liking it. But not classical music. Metallica. I wanted to be a rock star. At Torrance High School I never sang in a choir, never had a music class or a voice lesson. I couldn’t read music, but I taught myself guitar and was lead singer in a hard rock band that played Southern California quite a bit and I got more comfortable on stage. Then the band broke apart. Anthony graduated from high school, sure only that he still wanted to be in music, preferably as that rock star. He enrolled at El Camino Community College. Music teachers there urged him to join a choir, take weekly lessons, learn to read music, sing in front of other musicians. He remembers being scared the first time he sang a solo, because it was a new experience. Next came the first extended classical choral work he had ever sung, the “Requiem” by Gabriel Faure. He sang the choral body of the work and got the baritone solo as well. Then he laughs a little and says, “You learn to swim by jumping in, I guess. Most of the good things that eventually happened to me came because I just showed up. He was in his first year at SC as an opera student in the master’s degree program when he received the invitation from Sharon Lavery to go across town for an appearance with her Downey Symphony. He would speak lines of poetry from the time of Vivaldi. In costume. He showed up, rehearsed, performed, and enchanted us all. And that brings us almost full-circle. Now in his second year at USC as a masters student, Anthony says, “I feel blessed about what I do, and I am still learning — there are so many fresh ideas out there. Not many people understand how much work it is to dedicate yourself to this art. I am honored to be called a music student. 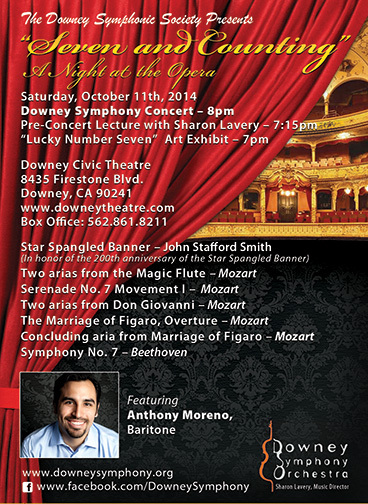 So at the next Downey Symphony concert on Saturday evening, Oct. 11, you will hear Baritone Anthony Moreno sing arias from three Mozart operas: “The Magic Flute,” “Don Giovanni,” and “The Marriage of Figaro.” (He promises to show up.) Also on the program are orchestral works by Mozart and Beethoven’s thrilling Symphony No. 7. A wow evening. Downey’s theatre is at 8435 Firestone Blvd. ; parking is free. Doors open at 6:30 p.m. for the lobby’s art show and Sharon Lavery’s pre-concert discussion, with concert time at 8. For ticket information and details, visit downeysymphony.org, or call the theater’s box office at (562) 861-8211.